I always have fun at these...and hope you can come and hang out with us as we chat all things beauty and skincare. 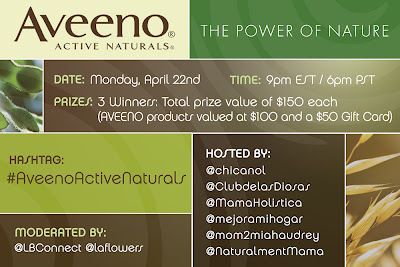 I along with some most fabulous ladies will be hosting the twitter party and introducing you (if you aren't in love already) to their Aveeno Active Naturals skin care line. I've gotten a chance to try all these products myself and can't wait to share my thoughts and answer any questions while we talk all things Aveeno. I wear this daily. It blends away my imperfections and protects my skin from the sun. It's a must if you live in sunny weather. I'm pretty happy with being able to moisturize, add a little color and protect my skin from the sun all at the same time. It's a time saver...something that is always appreciated. Call me lazy but I love me some cleansing pads. I really dislike the clean my makeup off wash my face dry my face routine... I usually leave that for the shower. These pads are soap-free, oil-free and hypoallergenic, they are good at removing the oil, dirt and makeup after a night at work or a day running around after the kids yet still sensitive enough for my skin. Another time saver!! This oatmeal based lotion always leaves my skin soft. Audrey and I both suffer from eczema (mine gets really bad when I'm stressed) and this really helps with the itchiness and dryness. I also love using it at work after all the frequent hand washing I do. Are you using Aveeno? We would love to hear about your experience! 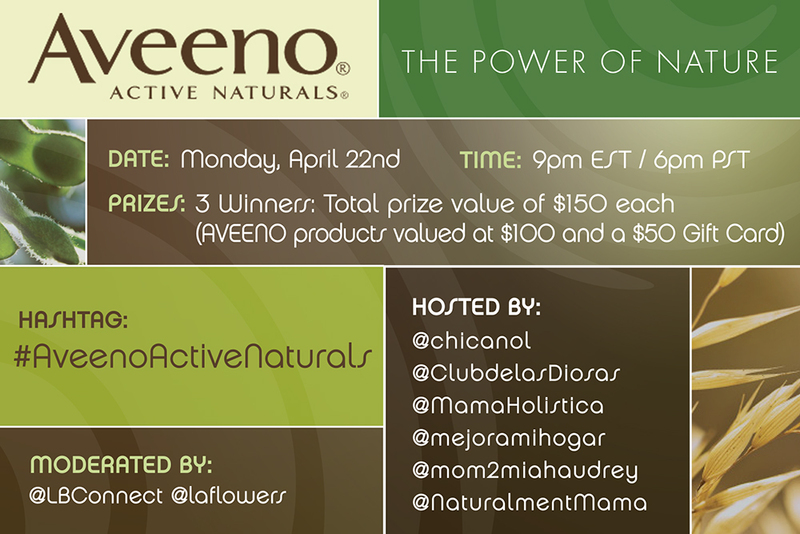 Join us Wednesday April 22d at 9pm EST/ 6pm PST on twitter by following the hashtag #AveenoActiveNaturals. Three winners will win a $150 prize pack filled with Aveeno products and a gift card!